It's cold outside, and it's snowing. A perfect time for a smoking cap. Ward Nicholas Boylston in a brilliant green banyan and a cap, painted by John Singleton Copley, 1767. From Wikipedia. 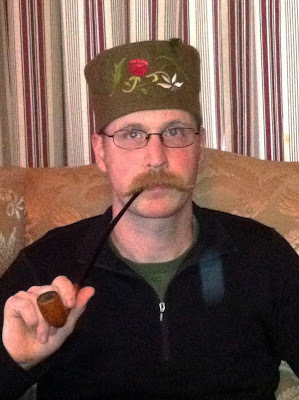 These would eventually change to more of a fez/pillbox shape for the Victorian smoking cap. 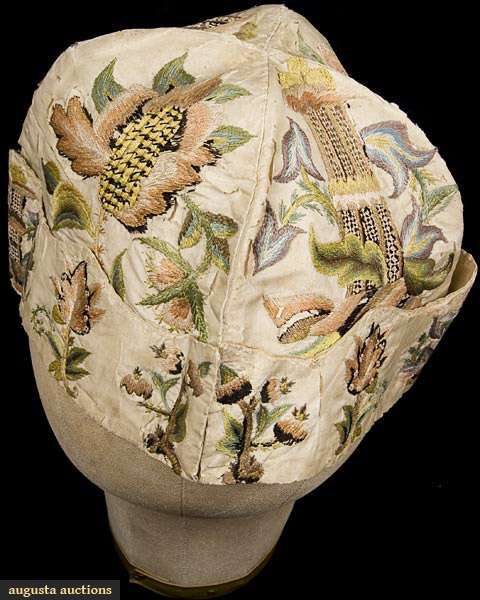 There are plenty of links online to patterns for smoking caps from Godey's Magazine (sort of a Victorian version of Better Homes & Garden and Vogue, mashed together), but most of them are appliqué or couched cord and braid. I wanted to embroider my pattern, so I found (what I thought was) a simple motif, and repeated it three times on a piece of paper the diameter of my head. I figured that three inches tall looked about right. I then used that paper as a pattern to cut out a length of heavy wool broadcloth - this is probably 28oz melton, definitely coat-weight - and a strip of linen backing. In the end I really didn't need the linen, but it helps the inside look neat. 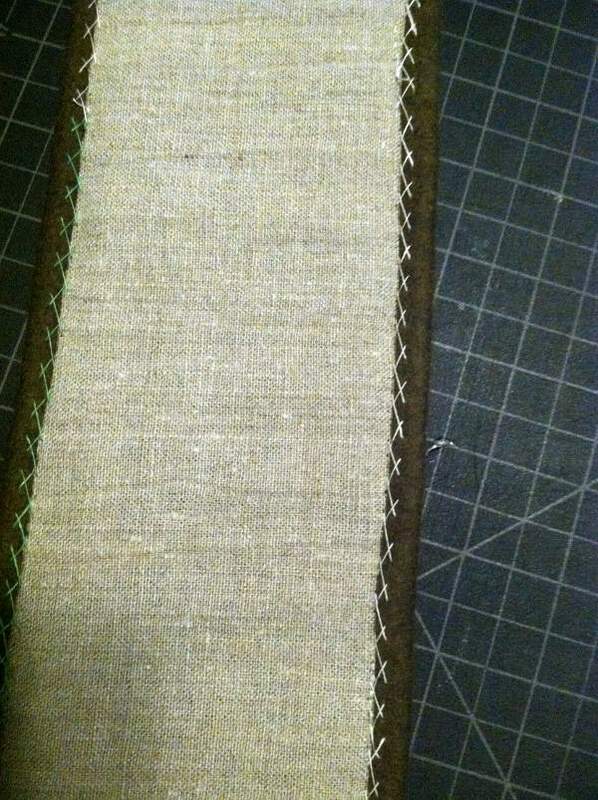 I cross stitched the wool to the linen. 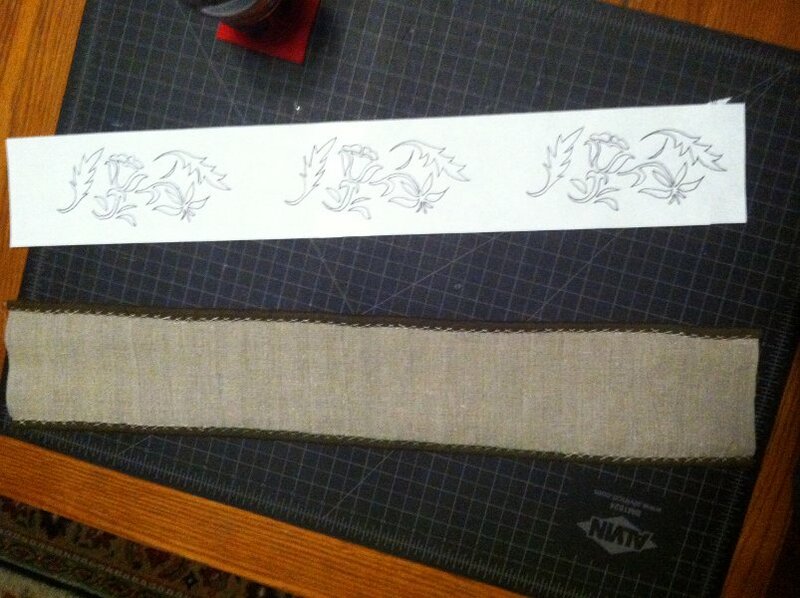 I then basted the paper with the motifs onto the wool, and back-stitched around all of the borders. 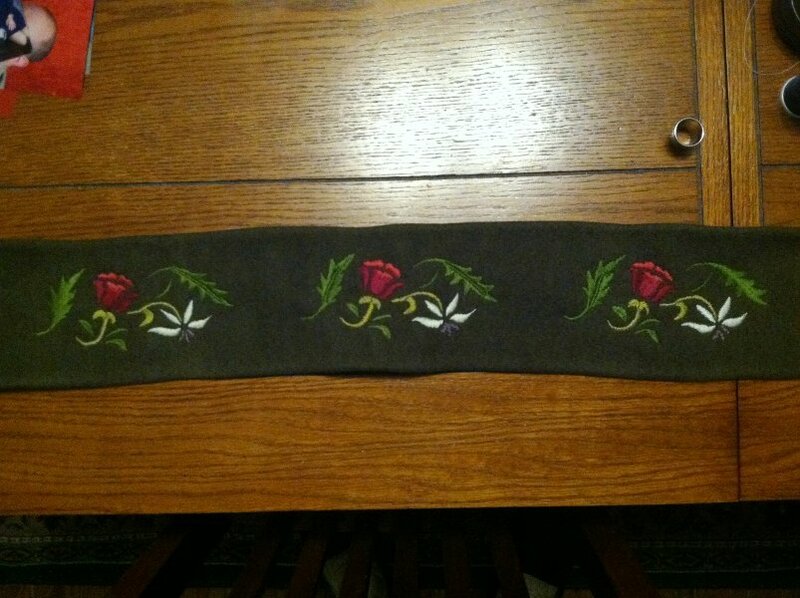 If I did this again I'd use stem stitch instead, for a fuller, more raised border, but at least that transferred the pattern to the cloth. 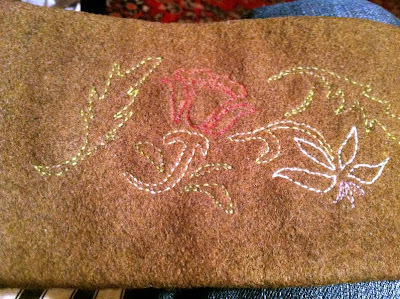 I then tore away the paper, picked out the little bits from underneath the stitches with a pair of tweezers, and was ready to embroider. Almost all of the embriodery is padded satin stitch. 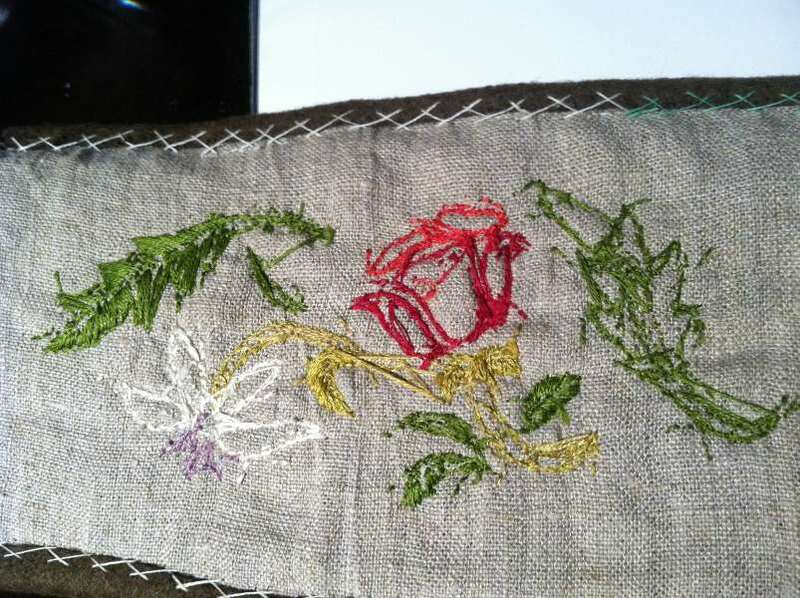 Some of the leaves are herringbone stitch, and the purple tips of the white flower are French knots. This wasn't simple. All told, it took at least 40 hours to embroider all three motifs. As you can see from the back, I tried to keep the amount of embroidery floss used to a minimum. And the finished cap. 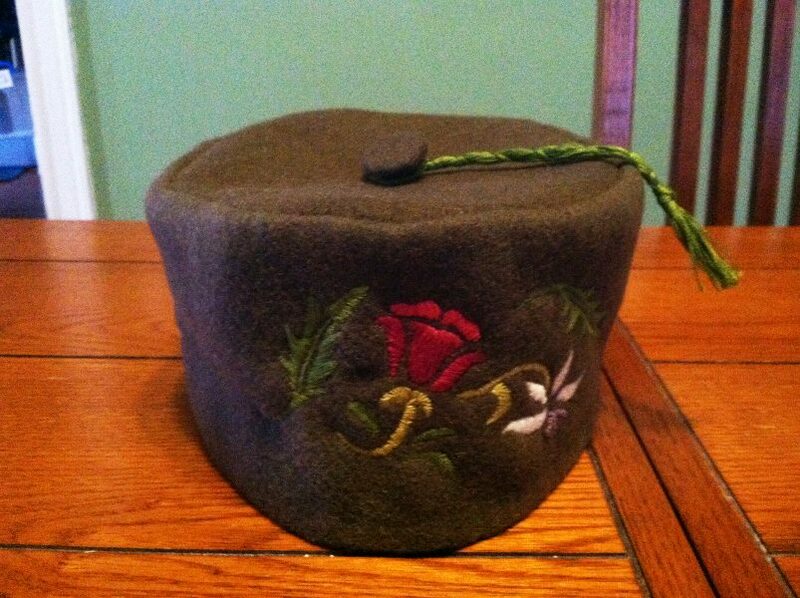 The button is a metal washer covered with the same wool. 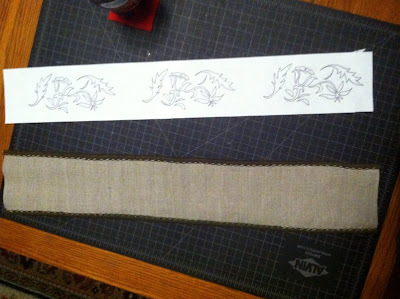 Now, having shown all that, let me just say that making a smoking cap is not tailor's work. You might have been able to purchase one pre-made in a haberdashery, but most often I believe they were made by a wife for her husband. There's a reason so many patterns show up in Godey's ladies magazine. 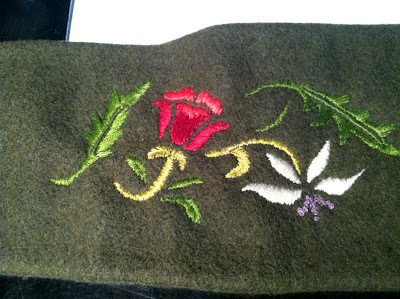 However, from the amount of work it takes to embroider such a cap, it's no wonder that most of the patterns are for couching and appliqué - those methods are much faster! I have a ridiculously silly question. Why would one require a special hat in order to smoke? How does it contribute to the smoking experience? Of course, this IS Victorian, so they did have special silverware for everything, but still. Regardless, it is a very nice hat. Warm, I'd imagine. Ahh, well the cap has two uses. The first is to keep the smell of smoke out of your hair. Of course, without a moustache cap as well, that pretty much doesn't matter. The other use - and the one I'll use the hat for most of the time - is just to keep your head warm in the cold winter months. What material did you use for this cap? I originally meant to post some text with the images, but then got carried away with other things and forgot to. If you look again now, you'll see your question answered. Smoking caps are just utterly fantabulous! You look smashing! 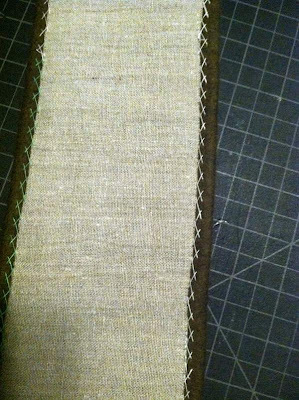 The previous posts show the copying and construction details in using the blanket without cutting separate pieces. Mrs. Mole, that looks like a wonderfully warm robe and cap. Thank you for sharing your process. Most elegant. I'm going to ask my daughters for one for my birthday!